When a son or daughter joins the family business, parents are understandably proud. But when the family franchise is the rough-and-tumble world of Houston police work, the stakes and emotions are cranked up a few notches. "He's going into the belly of the beast," veteran HPD detective Keith McMurtry said of his son's decision to join the force. The newest batch of Houston police cadets sworn in last week included 19 known as "legacies," comprising nearly a third of Academy Class No. 212. A legacy is a recruit who has a parent, brother, sister or in-law who is or was on the force. In most cases, a uniformed parent or close relative of the legacy was at the ceremony to pin a shiny badge to their cadet's new uniform as they took the stage at the M.O. Campbell Educational Center in northeast Houston. 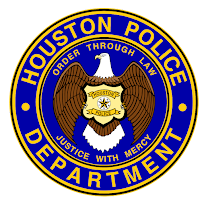 HPD already has an estimated 75 to 100 legacies on the 5,200-member force, a number considered higher than in most departments, said Houston Police Officer's Union president Ray Hunt. 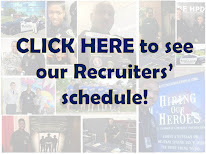 That's partly due to HPD's volunteer mentor program, which allows new recruits to be paired with veteran officers they are related to as they progress through the six-month academy and beyond, Hunt said. "It's a good thing because part of the support group that you have is your family," Hunt explained. "And if those families know what to expect prior to coming in here, because their dads and mothers have been a police officer for 30 years, clearly that is a lot easier for the adjustment." Hunt should know. His stepfather and brother-in-law were Houston cops, and his brother is currently an HPD sergeant. Police Chief Charles McClelland said legacies have proven to be a positive and productive addition to the force. "It's sort of like the clergy. People feel that it's a calling, and they are great models for their kids and other kids, and that's why a lot of police officers' children want to follow in their footsteps," McClelland said. "Normally the children of police officers are very dedicated officers. They're very hard-working employees because they don't want to tarnish their mom or dad's reputation." This class's leader was Mathew McMurtry, a 27-year-old Houston native who spent four years in the Marine Corps - with two tours in Iraq - before graduating last year with a political science degree from Texas A&M University. As McMurtry stood at attention on the stage in front of Chief McClelland, the badge was affixed to his uniform by his father. "The profession itself is an admirable job, and an honest job. A lot of that comes from my dad, and my grandfathers on both sides who were police officers too. I'm following in their path," McMurtry said. Keith McMurtry said his son has been immersed in police culture most of his life and is aware of sacrifices. "Tradition is something that should still be respected in 2012," the detective said. "And with him being raised in our household, he was immediately aware of all aspects, the long hours, the missing of baseball games. It's part of the package, and he's going to have a better idea than most. It's nothing like it's portrayed on TV." The legacies include some odds-defying similarities. 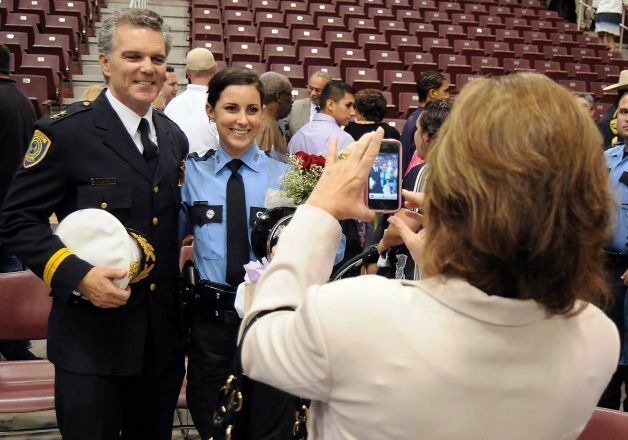 Gary Blankinship, a motorcycle officer who headed HPD's police union, and Assistant Chief Brian Lumpkin, both attended the same HPD academy class in 1982, and both have daughters who were sworn in Thursday night. 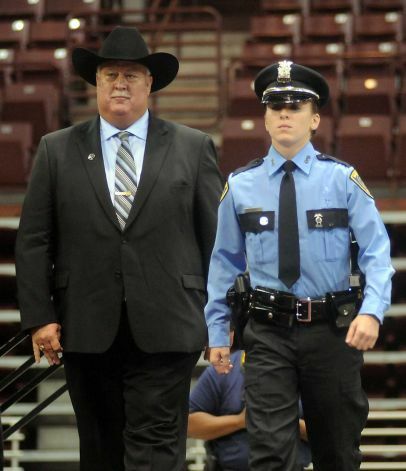 They are officers Nicole Blankinship-Reeves and Nichole Lumpkin. Brian Lumpkin believes a big draw to HPD is the variety and diversity of police work, ranging from anti-gang task forces, administrative posts, the aircraft division and special investigations. The city of Houston provides a generous compensation package, including retirement and annual salaries ranging from $42,126 up to $160,000 for an executive chief. Senior police officer J.J. Berry, who has spent nearly 37 years at HPD, pinned a badge on son-in-law Seemanth Raj, a 30-year-old St. Louis native who moved to Houston to teach school. 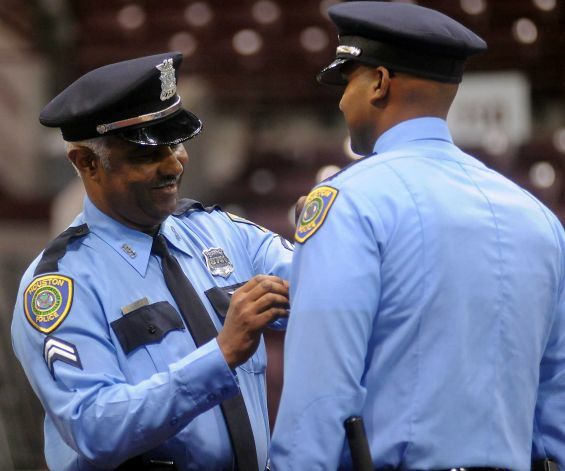 Two years ago, Berry pinned a badge on his son, HPD patrol officer Jordan Berry. "It's something that will never get boring, and it gives you great purpose because you're not just doing it for yourself, for fun, or because you want to be a cowboy. It's actually for the community itself, to keep people safe, Raj said."